Jack of All Tribes is rated 4.3 out of 5 by 44. Rated 5 out of 5 by Bobinette1 from More than time for a sequel!!! I've had this game for a looooong time and still love it. I tought that there would've been a sequel by now. I'll keep hoping for a sequel and don't be afraid to buy this one, it's a lot of fun. Rated 5 out of 5 by JulzCat from Untimed Management Is The Best! I very much enjoyed this game. 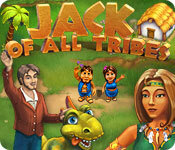 Jack was chilling at an amusement park when suddenly his ride led him to being the Chief of an ancient tribe! 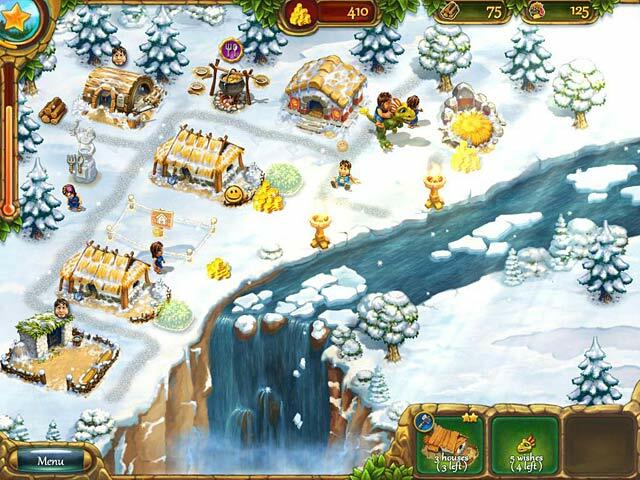 Build villages and save the locals from some nasty torch-wielding cavemen. Some people were claiming this wasn't enough of a challenge because you can do it untimed, but to me that was the best part. I enjoy the game play of time management games but hate the stress of having to beat the clock. If you want a challenge, you can beat the clock to win a gold star. There were also trophies to be won. Rated 5 out of 5 by LexaLovely from Loved it - Played over a dozen times My one complaint is that you can't skip the tutorial no matter how many times you have beaten the game. I play this all the time and I still think its cute and funny and fun. Its a good way to kill a couple of hours and some of the levels are a challenge to get a perfect score on so you stay engaged. The ending makes it seem like there will be a follow up especially since there are an odd number of levels but so far... nothing. I really hope they make more Jack of All Tribes games. Rated 5 out of 5 by VicciV from Fun and relaxing! I love this type of game, and this is the one I keep coming back to. It's fun, challenging enough to be interesting without causing stress, and funny as well. Rated 5 out of 5 by Bumbles2 from Oscar winning game!!! If there is such a thing for winning an Oscar for the best game ever...this one should win hands down !!! I found this game incredible funny while playing...the comments from the toons were extremely funny ! The most enjoyable game I've played in a very long time ! I'll bet the developers had a blast putting this one together !!! The game starts out very easy and gradually gets a little bit harder as you progress through the levels...but not so hard that you can't beat it. I enjoyed this game from start to finish and wish there was more. If you like to be entertained and love to have a good laugh once in a while (with the comments from the toons) then this is a must play! And last but not least...if I could give this game 20 out of 10 stars I definitely would!!! Rated 5 out of 5 by Breezed from Very Fun Time Management Game! Good story, very fun. Want a sequel please! Rated 5 out of 5 by Syndi_Rose from Super Fun I play and replay this game often, I love it. I just wish there was a sequel, or more just like it. Rated 5 out of 5 by leagueSK from BEST EVER!!!!!!!! 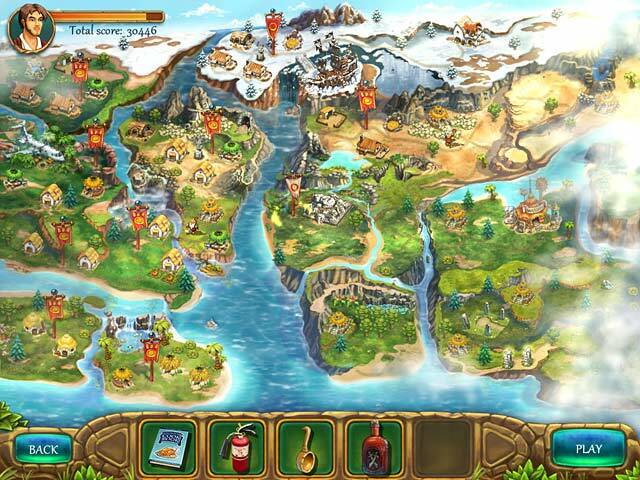 Jack of All Tribes has to be my most favourite time-management game! I love the colourful, vibrant graphics and the adorable dinos. The music is cheerful, but just like in most other games, it can get a bit repetitive. I absolutely adore the storyline, which I found filled with innocent humour. The difficulty is hard enough you don't feel like you're playing a child's game, but easy enough that you don't have to sweat trying to get the level finished before time runs out. All in all, I found this to be a cute, innocent game filled with humour and relaxing fun. The only problem with this is... IT DOESN'T HAVE A SEQUEL!!!!!!!!!!! Argghhhhh!!!!!!! Come on guys! Make another one! Rated 5 out of 5 by cruisergirl523 from Fun! Love this game! hoping for another. Wish this one had more levels. Rated 5 out of 5 by Ziggy_Zigster from More like Jack of all trades! This is your typical time-management game. You collect resources to build homes for your villagers as well as resource makers (farm, woodworker etc). You fight off invaders as you proceed through certain levels. 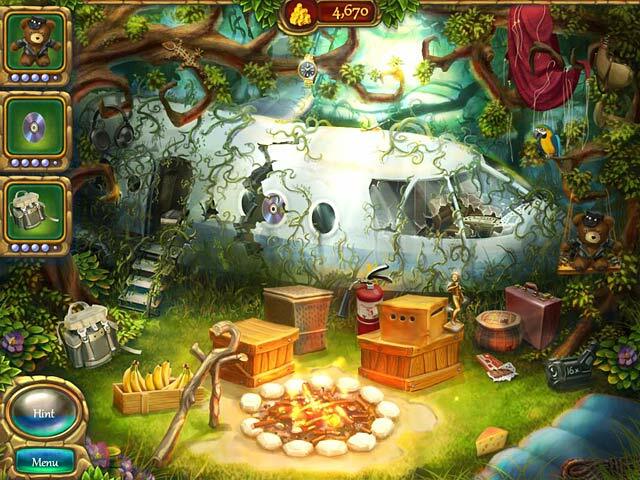 What separates this game from your typical TM game is the added 'hidden object' element. The HO scenes are reminiscent of the 'Gourmania' games. You have pictures of items you have to find and you can also collect coins in the HO scenes. I like this take on TM games. This game has lots of variety to it, as I said above. It's challenging but not frustrating. Give the demo a try. It's worth it.